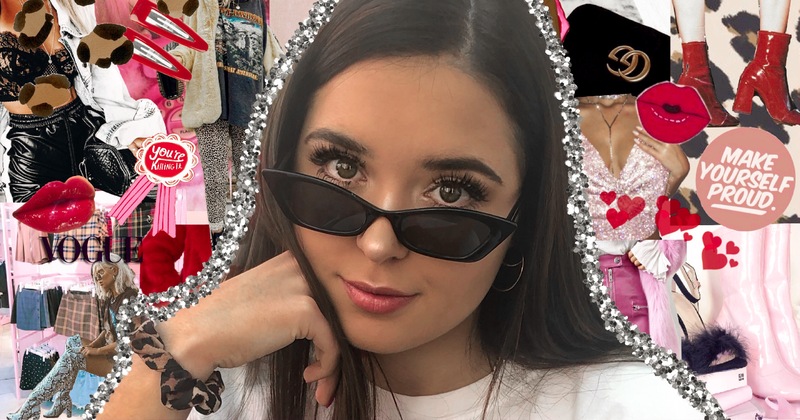 Todays blog is another post of a series called ‘Trend Tips’ where I collab with other bloggers, talk about current trends, and show how we style them! This post is a collab post with Emily Soule, one of the cutest bloggers EVER & today we’re covering checkered print! Checkered print is one of my favorite trends & I love to incorporate it into my style! This is a trend that was seen multiple times in the Tommy Hilfiger 2018 Spring/Summer line. My first look is a checkered skirt with an adorable zipper detail. I paired it with a pink body suit from forever 21 & a Brandy Melville beret. The black and white pattern makes it super easy to throw color in your outfit because it goes with every color! My second look is a sheer checkered long sleeve cropped shirt paired with extremely distressed jeans & a black bralette. Emily’s first look is a pair of joggers with checkered detailing down the side paired with a red cropped tank and adorable white sunnies. Emily’s second look is a checkered tube top with a pair of bright red glasses. Red is a great color to wear with this print because of how bright it is. Besides being one of my favorite colors, red is also one of the best colors to pair with this print. As you can tell from the pictures, we both used red in our outfits. Though you could use any color, red just really pops! This trend is one of my favorites & I’ll continue to experiment with it through the fall! I had a lot of fun with this Collab, Emily is a doll! Let me know what trends you want next!